Holding hands with two of her small children, Amal Mahmoud picks her way among puddles along an Aleppo street lined with the rubble of bombed houses. Mahmoud, 43, was widowed by a rocket blast that killed her husband. Her work as a domestic helper does not provide enough money to feed the eight members of her family. She is fighting to survive. “But my strength is weakening,” she says. 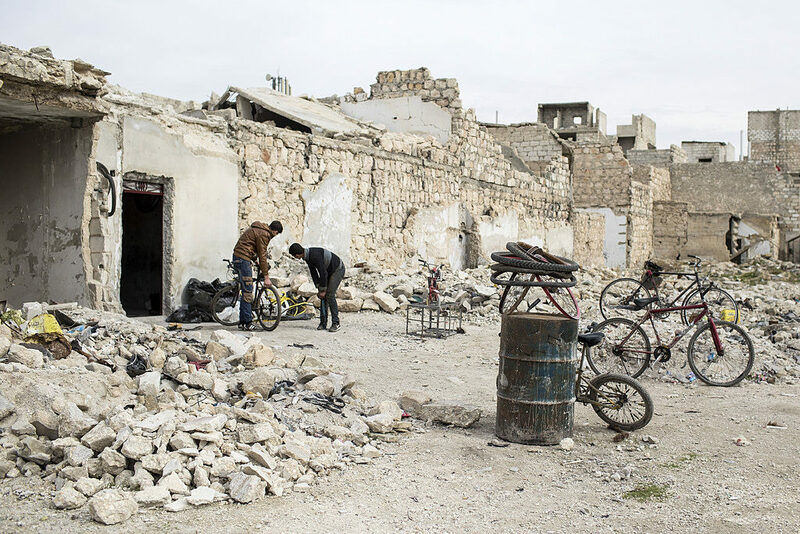 In Aleppo the bombardments and gunfire stopped in December 2016, but much of Syria’s largest city remains in ruins and more than two million people need humanitarian aid. Nearly four years of fighting destroyed the once bustling historic city, bitterly dividing it into government and rebel-held halves. The forces of President Bashar Assad ended the battle by capturing the rebel-held east in December 2016, but the devastation, human flight and division was so great that the city’s recovery has been painfully slow. Syria’s civil war, now in its eighth year and one of the world’s worst ever humanitarian catastrophes, still rages in other parts of the country. The United Nations estimates that 6.1 million people are internally displaced; 13.1 million are dependent on aid inside the country, with 5.6 million in acute need; and 5.5 million people have sought sanctuary in neighbouring countries. Such is the horror and confusion of the war that it is impossible to estimate the number of people killed. Most international experts cite a general figure of over 500,000 deaths. Peace has come to Aleppo and its conditions are improving, with supplies of water and electricity more frequent; but its requirements are urgent. Some 2.25 million people need humanitarian aid. The city is hosting over 960,000 internally displaced people and eastern Aleppo remains in ruins. Many relief organisations and charities are leaving . To help combat the crisis, Caritas is extending its work in the city by launching a three-year campaign. “The ongoing crisis in Aleppo requires a more focused intervention to ensure the needs of the most vulnerable are met and that people are supported to build their livelihoods and sustain them,” said George Kahal, director of Caritas in Aleppo. The Euro 4.1 million plan will help 34,300 people with assistance ranging from food and shelter to medicine and surgery. Mehmoud and her family will be beneficiaries of the plan. In her bare, bomb-damaged house in east Aleppo, she says that Caritas is already helping, providing them with aid such as food, blankets and clothes. Caritas’ work in the east and west of Aleppo has already reached more than 20,000 people with Euro 2.3 million dispensed in aid distributions, counselling and education, medical and rent support. This includes the distribution of some 5,000 food vouchers; clothes sent to some 1,700 households; over 700 households receiving rental support; and health-related assistance given to 2,566 vulnerable people. Non-food items handed out include kitchen kits, mattresses, battery-powered fans, solar-power lamps, water containers, carpets, detergents, and sanitary items. Caritas has given Aleppo’s children particular support. Some 476 affected children are engaged in psychosocial support. They participate in activities that help them develop social skills, including hand washing, being respectful to each other and expressing feelings. “At the end of each cycle we work to merge two different communities through an open day that brings together children and reunites groups of children in Aleppo,” said Kahal, director of Caritas in Aleppo. Most of the children of Aleppo have lost years of study. Caritas provides extra classes to help bring pupils up to speed. Caritas also gives assistance to public and private schools and to university students. Thanks to Caritas, more than 260 children have accessed tutoring and more than 280 received stationery supplies and school supplies. Ibtisan, who lives in Aleppo, sends all five of her children to school. They all also attend a local Caritas centre that provides extra classes in English, Maths and Arabic. In Jabal Badro, one of the area’s worst affected by the violence in eastern Aleppo, Caritas is the only organization helping residents. “Actually, we are not just helping with humanitarian aid, we are improving the lives of people there,” said Nawras Layous, Caritas project coordinator in Syria. Abou Ahmed, a 53-year-old father of five from Jabal Badro, said the water supply and other Caritas assistance he receives has “lifted a burden from my shoulders”. 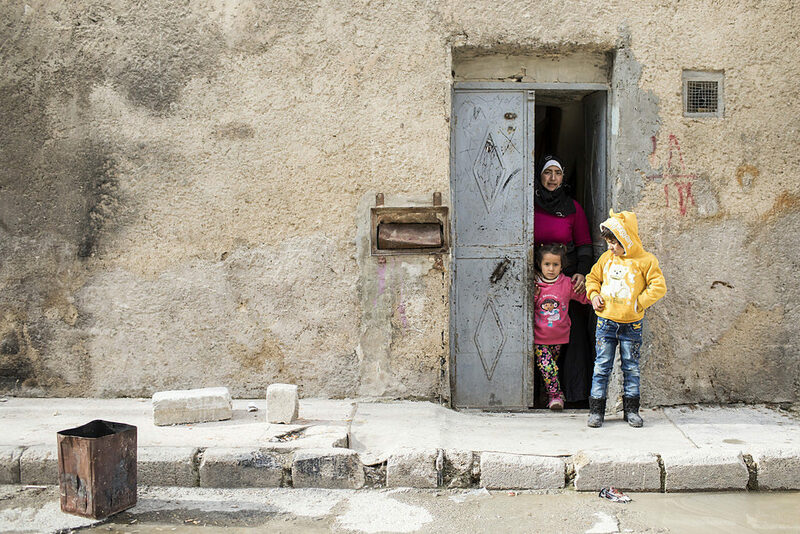 Caritas’ work to date and its new extended three-year plan to assist Aleppo cannot bring back the city to before the war, but it can help give its people a present. Caritas works in major crises zones throughout Syria, including the capital Damascus and the city of Homs. It helped 230,000 people inside the country in 2017.